The search for near-Earth asteroids that could threaten our planet, as described in “Fear of the Unknown,” by Lee Billings [Advances], should be a worldwide undertaking, no less than the effort to tackle the human causes of global warming. And unlike that program, it should not be hampered by powerful commercial interests. But at present, it's apparently entirely dependent on NASA funding, where it competes with various projects. Are other nations making any similar efforts? BILLINGS REPLIES: Because they are everybody's problem, Earth-threatening asteroids are all too often treated as nobody's problem. There is at present very little formal international collaboration on planetary defense, and most existing programs are funded by the U.S. Indeed, NASA is the largest and most prominent organization working on the problem. It is, however, not the only one. At present, the National Science Foundation, U.S. Air Force, Federal Emergency Management Agency and nonprofit B612 Foundation are also contributing to planetary defense in various ways. Meanwhile the European Space Agency is taking a leading role in the proposed Asteroid Impact & Deflection Assessment mission, which would attempt to alter the course of the nonthreatening binary asteroid 65803 Didymos. Are we ready to face a space rock hurtling toward Earth? Not entirely. Fortunately, our present suite of surveys suggests that time is on our side—no known asteroids pose a serious near-term threat to our planet. In “Click ‘n’ Pay” [TechnoFiles], David Pogue suggests that micropayments could make ubiquitous online ads unnecessary. Unfortunately, ads are with us forever. Micropayments sound nice for advertisers, but I predict they will be as effective as my paid print subscription to Scientific American. Despite a fairly sizable fee, I still face several ads. In terms of desirability, micropayments to remove ads are on par with paying a mob boss to avoid hurting you. Ad blockers restore the balance in favor of the consumer. We need stronger and better ones. “The Carbon Capture Fallacy,” by David Biello, reports that all credible plans to reduce global warming depend on carbon capture but that high costs make the widespread use of capture projects unlikely. The best way to capture carbon biologically is by enhancing photosynthesis and carbon sequestration in organic matter. A feasible and cost-effective approach to carbon sequestration is restoring the massive carbon sink in degraded grassland soils. The potential of grasslands to sequester carbon as organic matter in the soil has probably been underestimated. Most of the world's grasslands have been degraded through cultivation and soil erosion or by poor livestock management and overgrazing. Properly planned grazing on degraded grasslands worldwide has the poten-tial to make new soil and remove huge amounts of carbon from the atmosphere. As a retired U.S. naval officer who spent much of his life navigating the world's skies and oceans, I very much enjoyed “Where Am I? Where Am I Going?” by May-Britt Moser and Edvard I. Moser. But I must dispute the authors' comparison of the biological processes they describe with the Global Positioning System (GPS). This process very accurately describes inertial navigation that is augmented by other cues—something we called dead reckoning in the navy. Inertial navigation, even when augmented by cues from other sensors, is conducted internally (for example, within an airplane, boat or animal). In it, acceleration is combined with elapsed time to calculate direction and speed, with an estimated position as the output. In GPS navigation, actual position is the input that is continually updated from an external source (satellites); speed and direction are outputs. The nervous systems of animals don't function remotely like GPS, but they do function like an inertial navigation system. Isn't Michael Shermer missing the point about what is so unusual about the Homo naledi discovery in “Murder in the Cave” [Skeptic]? Regardless of whether the location of the remains was the result of burial, homicide or sacrifice, a creature with the brain size of a chimp engaged in humanlike behavior. SHERMER REPLIES: Indeed, the H. naledi finds constitute one of the most unusual ever made. The number, location and especially the peculiar fact that the fossils appear to have been purposefully deposited leave open so many interpretations. Determining their age, along with agreement on their classification, will answer some questions, but given the contentious history of paleoanthropology, the ultimate fate of how they got in that cave may never find scientific consensus. I read with interest “Death in the Water,” Katy Daigle's article about arsenic poisoning in groundwater and its devastating effects on those who must consume it. This has been a topic of concern to me for the past decade. In 2006 I presented a paper in New Delhi about a treatment process I had developed that uses common cattails. The process is simple and inexpensive: less than $5 for a system to treat a family of six's drinking water for five years. It uses no electricity, has no plumbing and relies on no moving parts. And it can remove arsenic from an average concentration of 300 micrograms per liter (μg/L) to below India's standard of 50 μg/L. “Murder in the Cave,” by Michael Shermer [Skeptic], incorrectly states that it is impossible to conclude where the recently reported Homo naledi fits into the hominin lineage because the species' age is not yet determined. Although that age is not yet known in the case of the H. naledi fossils, only morphological features are needed to determine which taxon a fossil belongs to. We regret that we cannot answer each one. 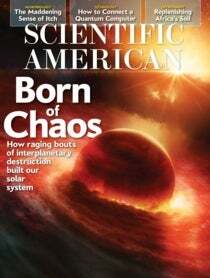 Join the conversation online—visit Scientific American on Facebook and Twitter. Did This Extinct Human Species Commit Homicide?